Remember my New Years Resolution to start a journal (and how I never did that)? I started last night! I think it's important to document life, even if i don't stick with it every single day. I'm pretty sure doing that in one of these beautiful hand-bound journals from Renewed Upon a Dream would make it even more exciting! If you would like to win a journal of your very own, check out Sarah's lovely shop and pick a favorite. Leave your favorite item in the comments here. The winner will be chosen on Thursday, February 28th and announced shortly after. This giveaway is for the black leather hand-bound journal shown. Please leave a separate comment for each entry. Good luck, friends! **You can find the StickyGram winner right here! very cute journal, i've always wanted to keep a journal as well. I have many half started ones. I'm hoping to stick with it one day. I love the grey leather notebook with lace! Journalling is one of my favorite things, this is an exciting give away! I liked them on Twitter & Facebook. I am completely enamoured by this beautiful piece! I love the yellow leather and lace notebook, so precious, but not too frilly and I love the color yellow! thanks for the opportunity! i love the leather lace journal in grey jade! i follow sarah's shop on twitter! i likes sarah's shop on facebook! thanks again for the opportunity! I LOVE the grey rustic notebook. Love the brown leather and lace notebooks! Thanks to you and Sarah for the giveaway. Wow- gorgeous journals! I'm in love with all the leather journals with lace (especially the Grey Leather Notebook with Lace) I've been meaning to start a journal, too. I may just have to buy a journal if I don't win! I love your blog, Katie! So much inspiration everyday. I journal every night, and am always looking for cute new ones to fill! It's always easier to keep up the habit if you can make it something beautiful that you'er proud of looking back on. I'd choose the "Maroon Leather Lace Journal - Handstitched Handbound Blank Notebook - Rustic Gifts - Pearl Buttons"
Sometimes I find a new blank journal a bit intimidating but I think the 'handbound feathers journal' could cure me! Thanks for the chance to win! My absolute favourite is actually the black journal you're giving away! I'm a writer, but I find typing so impersonal, so I hand write the majority of my work first. As such, i go through SO many journals, like, one every 2 weeks! I absolutely loove these! They're so pretty! And im also following on twiiter"
Ooo my favorite is the Leather Handbound Notebook Journal in Yellow. I love the bright color and lace, so unique! I love the maroon leather lace journal! I love the Leather Lace Journal in Grey Jade. I love the Leather and Lace Beige journal. These would make super cute sketchbooks too! Awesome giveaway! I really like the one you posted, actually. The "Leather Travel Journal in Black with Lace - Rustic Handbound Blank Notebook"!!! They're all so pretty and vintage looking! 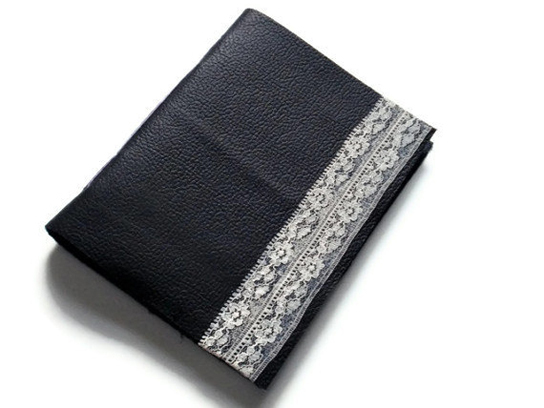 My favourite one on the site has got to be http://www.etsy.com/listing/109447110/handbound-blank-notebook-small-case? Oh I love the leather lace in grey jade! I also liked their Facebook page. Oh, my journal-obsessed heart just skipped a beat! These are just beautiful. I think my favorite is the maroon leather and lace (http://www.etsy.com/listing/111844487/maroon-leather-lace-journal-handstitched?)! i love the quarter leather journal in monaco blue starburst. it reminds me of old issues of national geographics. I have been obsessed with hand binding books recently!! I wish I was as good at it as the owner of this beautiful shop. I worked at a book factory during all of my breaks to put myself through college. I find it truly fascinating. My favorite is the Grey leather Journal with lace! ohh i love journaling! i love the leather lace journal in grey jade!! its beautiful, i have a soft spot for beautiful journals. Absolutely love the leather lace journal in grey jade. These are perfect. Oh my! They are all so pretty but my favourite is the Maroon Leather Lace Journal with two pearl buttons. My favorite is the Leather Lace Journal in Grey Jade! The Pink Rose Journal is an absolute vintage dream! And, it's absolutely adorable! Personally, a journal such as this one would make me want to document my life story for future generations to come! love the leather lace journal in brown! The Leather Lace Journal in Grey Jade is lovely :) Journaling is one of my favorite things--I'm always on the lookout for new ones, so thanks for giving me some more options! all of them are so nice! I think I like the Hot air balloon vintage circus print one best- I do love a fun print! I absolutely love the Leather & Lace Journal in Beige with Pearly Button. I am going through a period of self-discovery and journaling is a great way to reflect. Thanks so much for this giveaway that comes at a perfect time! I absolutey adore the Leather Notebook Journal in Maroon! I would use it constantly! I absolutely adore the Leather Notebook Journal in Maroon! I wouls use it ALLLL the time! Like on Facebook - Check ! Oh goodness. Each of the journals are oh so lovely but I particularly like the navy leather journal! Also liked on facebook. Thank you Katie! I actually really love the one that's being given away the best. Leather in grey jade. Um. Gorgeous. I really love the Red & Blue Buttonhole Journal. Gorgeous! Really love the Red & Blue Buttonhole journal. Gorgeous work! Hey! good morning from Spain!! I just love journals. I kept a journal every day for 11 years! I like all of the journals in her shop but the grey leather with lace is perfect for me now -- it is understated yet elegant! Either the Grey Leather Notebook with Lace, the Leather & Lace Journal in Beige, or the Brown Suede Notebook Small. I can't decide, they're all so charming! Love the Brown Leather and Lace journal! too. So beautiful! I am also following on twitter! The Owls Handbound Book Journal is ADORABLE!!!! Beautiful journals!! My favorite is the leather lace in grey jade. I've kept a journal consistently for 6 years. I love to flip back through my writings from time to time and brings back so many memories --- little details of life that I would have otherwise completely forgotten about. One of my goals this year is to scan or type all my journal entries out (just as a way to back them up). :) Would love, love, love to win!! Love the red or blue leather-bound journals! Thank you for the great giveaway! They are all lovely! I wish I knew how to make journals like that! I really like the yellow leather and lace journal. Thankyou for pointing Sarah out! I'm now following Renewed Upon a Dream on Facebook. I love the PInk rose journal! Gorgeous! 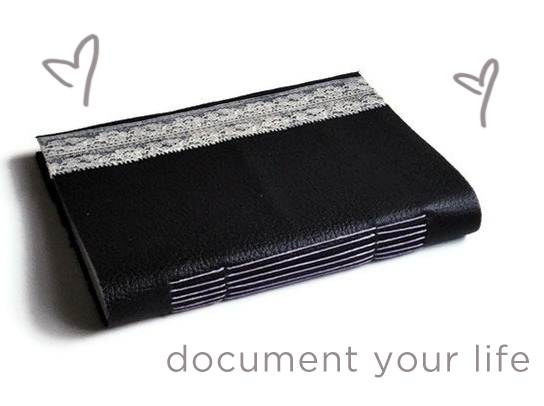 i would doodle inside the black leather journal with lace! They are all so lovely, my favourite would have to be the Quarter Leather Owl Notebook. Oh how lovely! I'm loving the brown leather journal with lace edge. These are BRILLIANT! May favourite has to be the Circus Hot Air Balloons Print with Cream Leather. Perfect for all circus plans! The grey leather notebook with lace is my favorite...I think. I love so many of them! I love the Red & Blue Design Handbound Book Journal. I love the book pictured, and it would be perfect as I embark on the scary new adventures I'm about to as my life is going through major change. I love the monaco blue notebook with gold button! Perfect for the new project I started earlier this week where I note down all the cute little moments with my daughter that I never want to forget! I love the jotter notebooks, especially the blue & black flowers one! I like the handbound journal with red birds on green evergreen - buttonhole style! The Leather Lace Journal in Grey Jade is really pretty. I would love to have it to be my new gratitude journal. I like the Leather Lace Journal in Grey Jade. I would love to have it for my new gratitude journal. The Grey Leather Notebook with Lace is beyond gorgeous! Oooh! I have to have a journal nearby and these are so pretty! I reeeally like the grey rustic notebook and the green leather journal with lace teal. So lovely! I love the Maroon leather lace journal with the pearl buttons. So pretty! Love the leather lace journal in jade, so fresh. I love this maroon journal! grey rustic leather notebook. i would love to put copies of my photo a day in there. ooo the Handbound Notebook Journal - Case Binding - Cream Bookcloth, Beautiful Multicolored Paper so gorgeous! I love the handbound feathers journal. What a beautiful and great giveaway. Fingers crossed I win. how cute! They grey leather and lace notebook is a beaut. this one is for sure my favorite! LOVE this grey jade leather&lace journal! Gorgeous! Liked on FB! :) Thanks for the giveaway! so pretty! and perfect for a compulsive doodler, like myself. The owl journal is the best! I love a blank book--full of possibilities! Thanks for the giveaway! I really love the Leather Lace Journal in Grey Jade. SO pretty! Following on Twitter as @unordinaryhello. Leather journals WITH lace? Girl after my own heart. This is my favorite: http://www.etsy.com/listing/112485087/maroon-leather-journal-with-lace-edge? The brown suede and peach leather are my favorites! I'm having a hard time picking just one favorite. I love the Circus Balloons Quarter Leather Jotter but I'm also crazy about the Grey Leather Notebook with Lace! Nothing to raise inspiration like a new journal! I love the ones with the leather and lace a lot, but I also really like the one with the roses on it - so pretty! Also, liked them on Facebook! Love the peach leather and the green leather with lace! I really love the Maroon Leather Lace Journal. So pretty! My favorite is the Handstitched Handbound Blank Notebook, my guy gave me a photo journal just like it and I love it! I love this journal : http://www.etsy.com/listing/110270709/black-leather-journal-handstitched? My favorite journal is the black leather hand-bound journal, it's simple and pretty. i would love to print out all of my photo a day pictures and post them in there to have them easily at my fingers to remember them. The beige leather and lace notebook is so pretty!